J Ethnopharmacol. 2017 Jan 20;196:1-8. doi: 10.1016/j.jep.2016.12.013. Epub 2016 Dec 10. 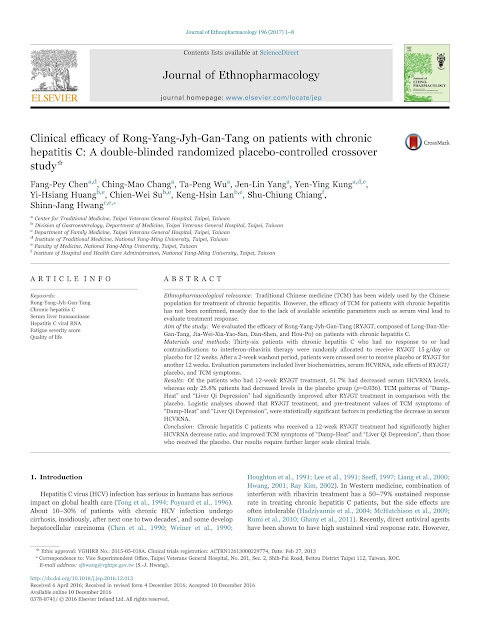 Clinical efficacy of Rong-Yang-Jyh-Gan-Tang on patients with chronic hepatitis C: A double-blinded randomized placebo-controlled crossover study. Chen FP1, Chang CM2, Wu TP2, Yang JL2, Kung YY3, Huang YH4, Su CW4, Lan KH4, Chiang SC5, Hwang SJ6. Traditional Chinese medicine (TCM) has been widely used by the Chinese population for treatment of chronic hepatitis. 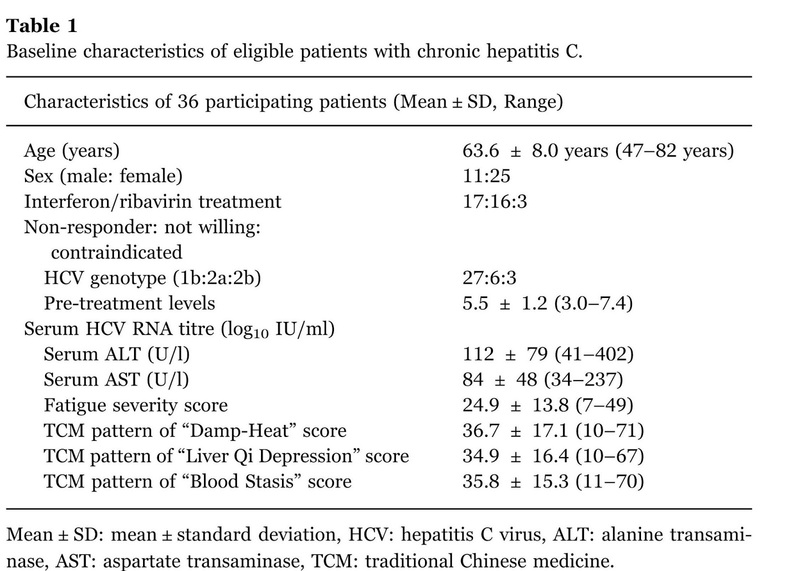 However, the efficacy of TCM for patients with chronic hepatitis has not been confirmed, mostly due to the lack of available scientific parameters such as serum viral load to evaluate treatment response. We evaluated the efficacy of Rong-Yang-Jyh-Gan-Tang (RYJGT, composed of Long-Dan-Xie-Gan-Tang, Jia-Wei-Xia-Yao-San, Dan-Shen, and Hou-Po) on patients with chronic hepatitis C.
Thirty-six patients with chronic hepatitis C who had no response to or had contraindications to interferon-ribavirin therapy were randomly allocated to receive RYJGT 15g/day or placebo for 12 weeks. After a 2-week washout period, patients were crossed over to receive placebo or RYJGT for another 12 weeks. Evaluation parameters included liver biochemistries, serum HCVRNA, side effects of RYJGT/placebo, and TCM symptoms. Of the patients who had 12-week RYJGT treatment, 51.7% had decreased serum HCVRNA levels, whereas only 25.8% patients had decreased levels in the placebo group (p=0.036). 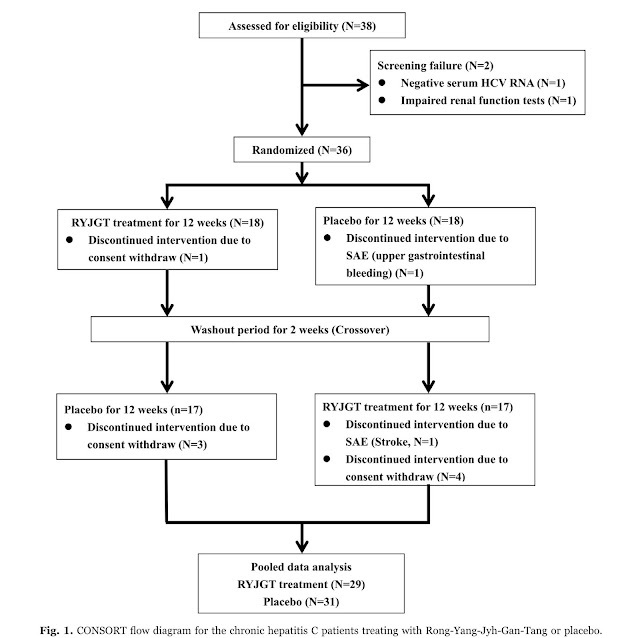 TCM patterns of "Damp-Heat" and "Liver Qi Depression" had significantly improved after RYJGT treatment in comparison with the placebo. Logistic analyses showed that RYJGT treatment, and pre-treatment values of TCM symptoms of "Damp-Heat" and "Liver Qi Depression", were statistically significant factors in predicting the decrease in serum HCVRNA. 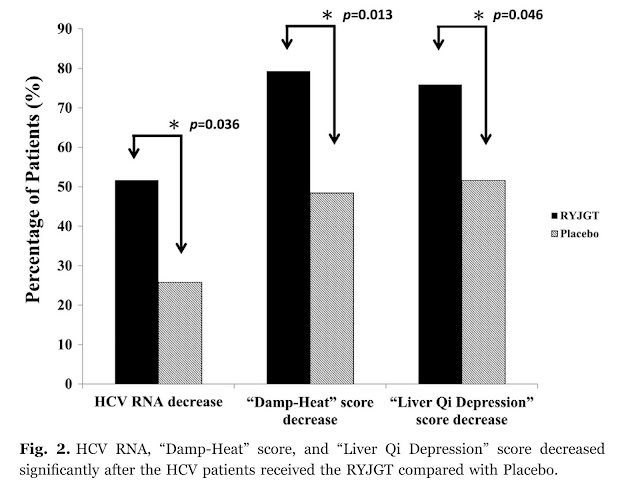 Chronic hepatitis C patients who received a 12-week RYJGT treatment had significantly higher HCVRNA decrease ratio, and improved TCM symptoms of "Damp-Heat" and "Liver Qi Depression", than those who received the placebo. Our results require further larger scale clinical trials.